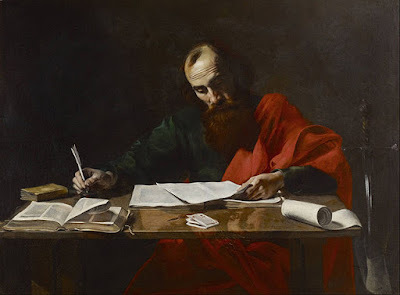 Image: St. Paul Writing His Epistles, by Valentin de Bolougne, c. 1618. Note: I spoke in a Reformation Conference last weekend at Redeeming Grace Church in Matthews, VA. The topic was the canon of Scripture. Here are some of my notes from the opening conference message, noting the connection between canon and inspiration. The books that make up the canon of Christian Scripture are inspired books, God-breathed books. This is the fundamental quality which they possess which distinguishes them from all other uninspired writings, including those that might be spiritually profitable. The Scriptures are autopistos [self-authenticating], because they are God-breathed. Given this reality, it would be accurate to say that the canon of Scripture was completed and became closed when the last inspired book was written, perhaps the book of Revelation, around AD 90. This was the culmination of a process that had begun some 1500 years before when Moses composed the Pentateuch. It would also be appropriate to say that this canon has existed since its completion, even in times when it has not been properly recognized and acknowledged by God’s people. It is sometimes said both by skeptics and, interestingly enough, also within some Christian traditions (Roman Catholicism and Eastern Orthodoxy) that the church chose the Scriptures. We believe it is more biblically faithful to say that the church did not choose the canon, but that it acknowledged or recognized it for what it is in essence: the God-breathed, inscripturated Word. In fact, it is also more historically reliable to take this position as well, given that we must conclude that the recognition or acknowledgement of the canon of Christian Scripture did not come about from the top-down, through conciliar decisions, but from the bottom-up through the organic usage of God’s people. How is it that God’s people are able to recognize these inspired, canonical books as the Word of God and to distinguish them from uninspired works? It is a spiritual process that defies any simple, naturalistic explanation. First, we acknowledge, again, that the inspired Scriptures are breathed out by the Holy Spirit of God. As Peter puts it, “For the prophecy came not in old time by the will of man: but holy men of God spoke as they were moved by the Holy Ghost” (2 Peter 1:21). Second, believers have been regenerated by this same Holy Spirit who then indwells them (cf. Romans 8:8-11). Thus, Paul can conclude, “Now if any man have not the Spirit of Christ, he is none of his” (Romans 8:9). Positively, he can also affirm that the Spirit of God “beareth witness” with the spirit of the believer (Romans 8:16). How, then, is it that a believer recognizes the Word of God? The Spirit of God which is in him resonates with the Spirit of God which is in the Scriptures. This is the way Jesus himself describes this phenomenon in John 10:27: “My sheep hear my voice, and I know them, and they follow me.” Christians recognize in the inspired, canonical Scriptures, the voice of their Shepherd. WM 83: Ipsissima Verba or Ipsissima Vox? Did the church choose the canon?